Gayle asked me to post a picture of the back of the areas I had pearled and waffled to show better how I did this. In both cases, I hook all the white (or light) wool. Then I go back in with deeper and deeper values, hooking between the white. As you will see from these pictures, I would never pass the grade on my back because these areas are not smooth and flat. But the only way to achieve the pointillism effect on the front is to sacrifice the rules for the back. The pearled area is the nose. It has many more crossovers because I am jumping around more only laying the wool in one or two holes adjacent to each other. I stagger a lot. I work in the direction I would normally hook the area (contour of face, around the ear, linearly, etc.). The waffled area is the beard. It has less crossovers because I am working by filling a greater number of holes adjacent to each other, although still jumping around. I still stagger, but less frequently. Jane Halliwell Green (who writes Jane's Green Art blog) has a new book on pictorial hooking that is coming out soon. She is working on developing a video to include with the book and she has put up a trial run on YouTube where she shows how to use prodding effectively in landscapes as grass and to give distinction scenery. I will add her video to my virtual classroom. Her book can be pre-ordered at Amazon for a substantial discount: Pictorial Hooked Rugs by Jane Halliwell Green. It looks like it is going to contain a bunch of new ideas and artistic tips for making pictorials pop! The Stash Sisters are some of the most creative women I have ever had the pleasure of rug hooking with. None are afraid of color and experimenting with fabrics. Each came with the sampler top sewn and we first worked on the sunflower, talked about daisies and leaves, and in a couple of hours all had their sampler tops well underway. I loved the way in which each person made the sampler top her own. Sondra and Sylvia put some blocks of linen in, so that they could hook some elements on their samplers. Martha used black and white plaids for her sampler top which gave her a wonderful neutral but stunning canvas for prodding. Louise, Janie and Annie combined bright wools for tops that show off with limes and plums and oranges. P.D. 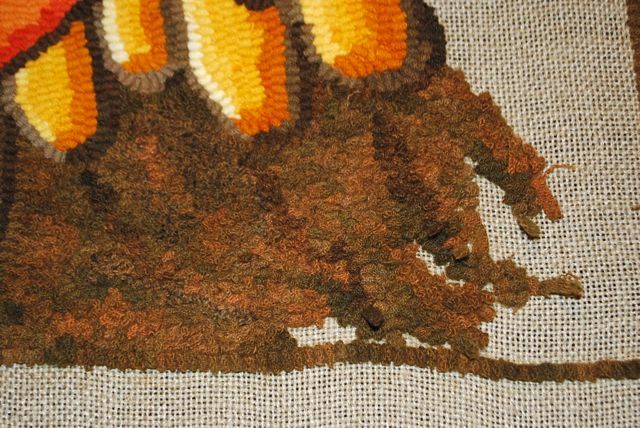 worked on Mr. Toad's Garden and used an outstanding mottled wool for sunflower leaves. I can't wait to see the progress on these pieces in a few weeks!